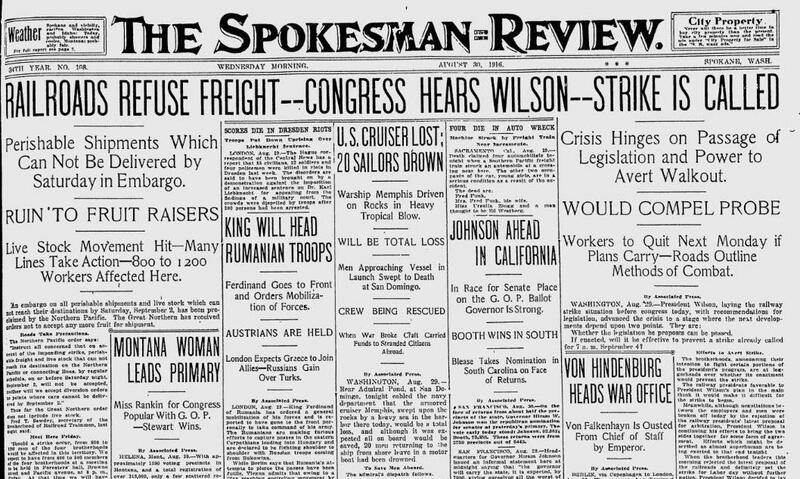 The railroad unions called for a nationwide strike to begin in several days, and the repercussions were already being felt in Spokane. The Northern Pacific announced an immediate embargo on all “perishable shipments and livestock.” The Great Northern stopped taking any orders for perishable fruit. Their fear was that the strike would halt trains before they reached their destinations. Meanwhile, local railroad workers were gathering for a massive union meeting at Forester’s Hall to discuss the possible strike. Union leaders said the strike would affect between 800 to 1,200 men in the Spokane region. From the political beat: The election news out of Montana was stunning: Jeannette Rankin, a Missoula political activist, was leading the Republican primary for a U.S. House seat. “Since leaving college, she has devoted her entire time to the cause of equal suffrage in this and other states,” a Missoula correspondent said. As it turned out, she would go on to win both the primary and the general election, becoming the first woman to hold federal office in the U.S.